19 November 1914 – Guest Post: She married an alien…. Of all the Wandsworth families shattered by war, there was one group which could expect little sympathy from their neighbours. These were the British wives and children of German husbands arrested and interned for the duration. When war broke out there was a thriving German community in London. The 1911 census records 53,324 Germans in England and Wales, and about half of these were living in London. 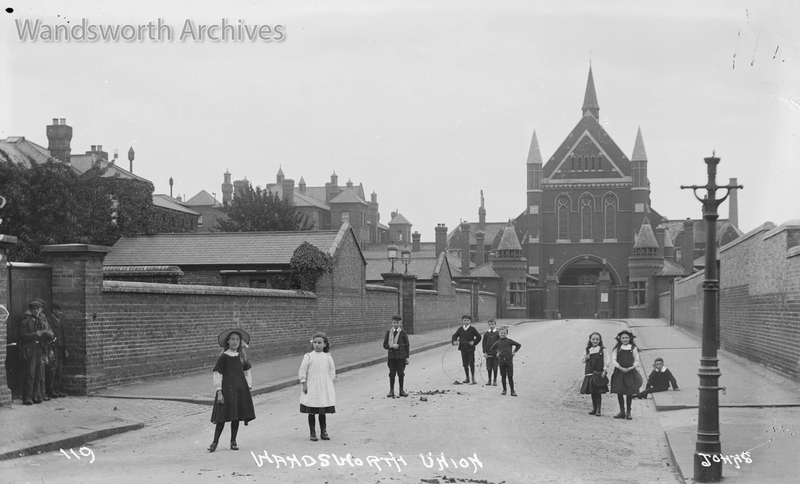 Wandsworth was not by any means the largest centre of German settlement – in the East End and around Tottenham Court Road there were enough Germans to have established their own clubs, churches and even a German Hospital at Dalston – but here too there were Germans living in every part of the borough. On 5 August 1914 the Aliens Restrictions Act was introduced in a single day. This required all German nationals to register immediately, usually at the nearest police station, and shortly thereafter the government started to round up German males of military age. German women were able to return home via a neutral country, but many German nationals had British-born wives and children, who had no wish to be sent to a hostile country. Technically the wives had become German nationals the moment they married, even when their husbands had arrived in England as infants, and themselves spoke little German. The earliest date of internment recorded for a Wandsworth man is for Thomas Jacob Diener. By 8 August 1914 he had been picked up from his job as a waiter at the Waldorf Hotel Aldwych, leaving his 22 year old wife Lily and their baby daughter Margaret in Sheepcote Lane Battersea with no means of support. Reciprocal arrangements between the combatant countries were reached to make provision for these families when the breadwinner was interned, and in the UK these were administered through the local Boards of Guardians who administered the Poor Law. “The German and Austrian embassies are said to have placed funds at the disposal of the American embassy for the benefit of their distressed nationals, but they have said it cannot be used for British-born wives of interned persons and their children. The Government has decided that the Boards of Guardians should administer the Funds for these people, but from a special LGB fund. A uniform rate of 10s a week should be paid per woman, with 1s 6d for each dependent child, regardless of the husband’s former earnings. This is the London rate, a lesser amount being paid outside London. The women are to be informed that this is not Poor Law relief. Wandsworth Board of Guardians then maintained a register of all those who applied for help. They received 182 applications from families who had no means of support because the husband had been interned, living all over the boroughs of Wandsworth and Battersea. How Lily managed to keep herself and her baby until the support arrangements came into effect in November remains a mystery. While the relief fund kept her going through the war, Thomas disappears from UK records after the war. Like 84% of German internees still interned at the Armistice, he will have been repatriated at the end of the war, never to see his family again. Lily remarried in 1940. Only six other families applied for funds in 1914, but as the war intensifies in 1915 we will see that the pressure to intern more aliens becomes irresistible. WABG/207/01, Wandsworth Board of Guardians Aliens Relief Register, held at the LMA. The meeting of the Board of Guardians on 17 September noted that 37 of their staff had joined up so far. Those who had joined up were mostly going to the Royal Army Medical Corps or Nursing, with some others joining the TA, Army, Marines and Navy. Generally when thinking of the staff employed by the Board of Guardians you might think of those who ran the Swaffield Road Institution (formerly known as the workhouse), but the Wandsworth and Clapham Union also ran hospitals – St James Infirmary in Balham, St Johns Infirmary on St Johns Hill and the Tooting Home on Church Lane. Staff volunteering for nursing and the RAMC means we can divert slightly away from precisely what was happening in the borough this week and look at an institution that had been developing since the outbreak of war – the 3rd London General Hospital. The 3rd London was based in what had been the Royal Victoria Patriotic Asylum, a school for the orphaned daughters of servicemen on Wandsworth Common. When war broke out the building was requisitioned and work began to transform it into a hospital. From 1915 the Hospital began publishing a magazine, and both the Commanding Officer (CO) and the Assistant Matron wrote about their experience in setting it up. Four General Hospitals were to be set up in London and officers involved came from the staff of other London hospitals – for the 3rd London, they came from the Middlesex, St Mary’s and University College Hospitals. The CO writes in 1915 that when the order to mobilise came very little was known and “the only safe course appeared to be to act first and to get authority afterwards”. The school had to be emptied and equipment acquired, including getting the only X-ray machine on the market in London – normally these came from Germany but this was obviously impossible and it would be some time before they could get them from America. Much of the equipment ordered was for a Field Hospital and the 3rd London had different requirements so supplies were starting to run short. The CO describes being given 150 beds, which turned out to be bunks for temporary use in times of strike and not suitable for a hospital. By ten days after the mobilisation order 520 beds were ready – 350 of which were actual beds and the rest mattresses on the floor. Operating theatres were ready and most of the staff were there. The staff coming to the hospital also had to ensure that the school was fully moved out. The chapel was turned into a store-house, and lockers cleared out into carefully bags to ensure that children’s toys were not lost. Huts were built to act as additional wards, and after eight weeks of work there was space for 520 actual beds. The staff came from a wide range of professions – teachers, actors, dentists, a retired professional boxer, painters, a theatre carpenter – and were all either unfit for active combatant service or were over the age of enlistment. Nurses were found local accommodation, with the help of Captain Dodson, who had formerly been the doctor for the Patriotic School. The first patients arrived on 25 September 1914, so in this week in Wandsworth the 3rd London General Hospital was very much still preparing for what was to come. Copies of the 3rd London Hospital Gazette ar at Wandsworth Heritage Service.